I love getting new shoes but I hate the break-in time. We have all gotten new shoes and ended up with blisters or pinches along with other uncomfortable obstacles. We can easily take charge and correct the issues but imagine those cute little baby feet. We all know how cute baby shoes are but how comfortable are they? Our babies can't tell us if their shoes are uncomfortable and causing them pain. They need comfortable, flexible shoes that they can move in without restrictions. Boumy shoes are made of 100% soft genuine leather and have a comfortable elastic ankle closure. Making them comfortable and functional for babies, infants and toddlers. I love the look and feel of them, they are so soft and flexible and super cute and stylish. All of which are very important for both children and mothers. Boumy shoes are made for both boys and girls, and are available in a variety of colorful and fun applique designs, basic solid colors and boot styles. You can shop by gender or collection. Most styles are available in sizes small (0-6mos), medium (6-12mos), large (12-18mos) and extra large (18-24mos). My personal favorites are the Flower Power Purple for girls and the Sportstripes Navy for boys. If you'd like to purchase a pair you can use coupon code MAB072011 at checkout to receive 20% off your purchase. Offer valid through July 31, 2011. You can also find Boumy on Facebook! 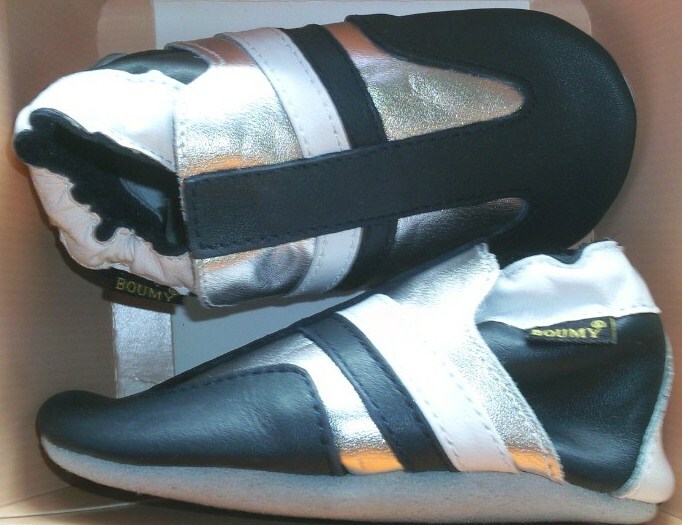 The Boumy brand was created by Anouk Henderson in 1998 in the Netherlands. At the time, Anouk was the mother of 2 baby boys and she couldn't find stylish and high quality leather 'easy to slip on and stay on' baby shoes. So she decided to design her own baby shoes for her boys. These designs turned into her first shoe collection and she named it Boumy, the nickname of her youngest son. Boumy started out as a hobby for Anouk but it quickly turned into a growing business. The brand started selling to retailers in Holland where the Boumy brand was quickly noticed by Mothers as the ideal baby shoe. In addition Boumy started to exhibit at international trade shows in the Netherlands, Germany and Belgium. It was at Pitti Bimbo in Florence, Italy, the most prestigious tradeshow for children’s fashion, that Boumy was really discovered by the international community and is now sold in various countries around the world. Now, they bring their adorable collection of Boumy shoes to the US and Canada! **This review was provided through MamaBuzz. The product was provided by Boumy Shoes for this review. Regardless, I only recommend products or services I personally believe will be good for my readers. The views and opinions expressed on this blog are purely my own. Results may vary.